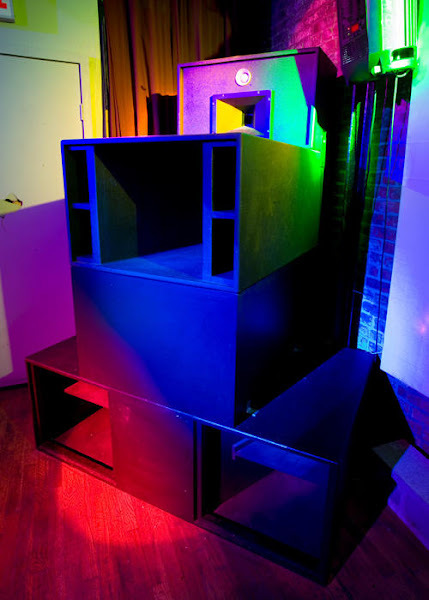 That, up there, is one fourth of the soundsystem we’re using at the party this weekend. Organized for us by production and DJ duo Bad Decision, the system was designed by a gent named Shorty, who designed and installed the sound rig at a place called Stereo in Montreal (a system that Francois K is rumored to have said is the best he’s played on since the Paradise Garage). Mister Saturday Night: There are very few people making hi-fidelity systems like the ones you design. What made you want to be an audio technician? Shorty: My Father was an audiophile, [so] I grew up around it. His best friend owned a hi-fi shop, so every week they were bringing home new products to play with, and I got to hear the best of audio for many years and learned what audio was really supposed to sound like. When I was older – not old enough to work legally – I worked in a high end shop installing systems in cars and homes, then eventually I sold hi-fi when I was of age. Then I started going out to clubs, and I said, “This is what I want to do: build systems in clubs.” So I got jobs in shops, then eventually became the sound guy at Twilo under Steve Dash. He asked Phil [Smith, co-owner of Twilo] to hire me, so he did. MSN: Through your years working in the sound business, you’ve probably seen a lot of crazy things, heard a lot of great DJ sets and been to a lot of great parties. What’s one experience that stands out in your mind? Shorty: Too many to mention. I have been around so many great venues, systems and DJs; and I’ve built some of the finest systems as well, so it’s hard to say. To sum it up, Larry at The Garage, Junior and Frankie at Sound Factory on 27th Street, Junior again, working with him at Twilo, and David Morales at Stereo on my system, which was epic. MSN: You spent the night at Mister Saturday a couple weeks back. How does it compare to other nightlife experiences you’ve had? Shorty: Well, it’s funny. It brought me back to the Sound Factory. From the entrance way, just the freedom in the space, the raw walls, the feel of the space, the vibe, the music and, of course, the sound [laughs]. MSN: The technicalities of sound can be intimidating for a lot of people. In as simple terms as possible, how would you describe the system that’s set up a Mister Saturday Night and what makes it different than other systems? Shorty: It’s an audiophile analog sound system. In this system I’m using hi-fi components like TAD drivers in custom Systems By Shorty enclosures. For example, in the processing, I’m using a pure Class A circuit that is fully discrete and has no IC chips; it’s the highest quality circuit that can be used in audio. It’s never done in pro audio in nightclubs, because it’s too expensive to produce and far too exact, so it’s hard to work with. MSN: Finally, the all-important question for any sound man, what’s your favorite record? MSN: We’ll make sure to play that one next time. Good talking to you, Shorty. We’ll see you this weekend!!! Nice, love the tech details. More please!